Home > Archives > Heartland Flyer led by P32-8 No. 500, 2010s. 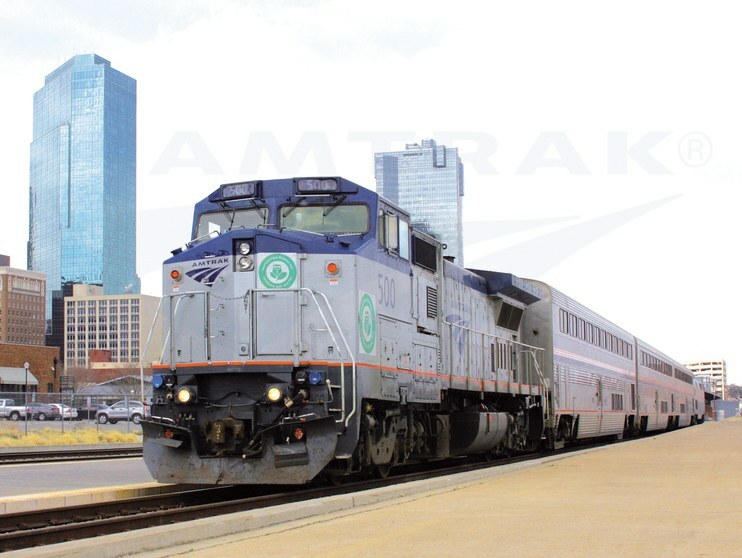 The Heartland Flyer was initiated in June, 1999, restoring passenger rail service to Oklahoma for the first time since the discontinuance of the Lone Star (Chicago-Dallas/Houston) 20 years earlier. Using a grant from the Federal Railroad Administration, Amtrak and the Oklahoma Department of Transportation carried out a one-year research project (April 2010-April 2011) during which the train was run on a biodiesel blend known as B20 (20% pure biofuel and 80% diesel). P32-8 locomotive No. 500, shown above at the Fort Worth station, carried an Amtrak decal indicating the use of B20 fuel to make certain only the biodiesel fuel was used in the 3,200-horsepower, 12-cylinder engine. Photographer: Doug Riddell for Amtrak. From the Amtrak Corporate Collection.